With more than 20 commencement ceremonies taking place each year, the CCAA is proud to continuously welcome new alumni to the Alumni Association. Would you like to provide the alumni charge at a commencement ceremony? Email ccalum@ccis.edu for more information. 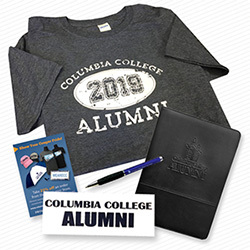 2019 Graduates: Order your official alumni Grad Pack! Columbia College, 1001 Rogers St, Columbia MO 65216 • ©2018 All rights reserved.